Xiaomi has launched Xiaomi Mi 6X smartphone in It comes with 18:9 Display, 20MP front camera similar to Xiaomi Redmi Note 5 Pro. 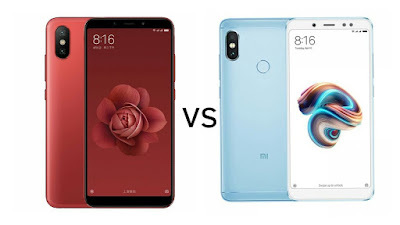 Check out price, Specs, Features comparison between Xiaomi Mi 6X and Xiaomi Redmi Note 5 Pro. Both Phones has 5.99-inch (2160×1080 pixels) Full HD+ 2.5D curved glass display, Metal body, Fingerprint Scanner. Mi 6X Does not come with Headphone Jack. Xiaomi Redmi Note 5 Pro has 4000mAh battery compared to 3010mAh battery on Mi 6X. Xiaomi Mi 6X comes in Black, Blue, Red, Gold and Rose Gold colors priced at 1599 yuan for the 4GB RAM, 1799 yuan for the 6GB RAM with 64GB storage version and the top-end 6GB RAM with 128GB storage version costs 1999 yuan. Xiaomi Redmi Note 5 Pro cost Rs 14,999 for 4GB RAM and 16999 for 6GB RAM.Xiaomi Mi A2 comes in Lake Blue, Gold, Rose Gold and Black colors is priced at Rs. 16,999 for the 4GB RAM with 64GB RAM version, and the 6GB RAM with 128GB storage version will be available soon.